A limited run of special-edition R8 coupes will arrive exclusively in the US later this month. American Audi fans rejoice as the German automaker has announced a limited run of 50 special-edition R8 coupes - 20 V8 models and 30 V10s - exclusively for the U.S. market. Called the Exclusive Selection Edition, the special R8s are distinguished by unique exterior and interior colors. The V8 model, for starters, comes in matte gray with carbon-fiber front splitter and diffuser, blacked-out grille and exhaust tips, red brake calipers, the taillights from the R8 GT and 19-inch titanium-finish split-five-spoke wheels. The interior of the eight-cylinder special features red stitching and trim, with carbon fiber elements and a Bang and Olufsen Sound System with Audi Music Interface. A leather multifunctional sport steering wheel with thicker rim should help handle the 430 horsepower and 316 lb-ft of torque from the 4.2-liter FSI V8. The V10 model, meanwhile, is decked out in slick Ibis White with black side-blades, license plate surround and mirror housings, R8 GT taillights and two-tone 19" e-tron wheels. Where red highlights the V8 model&apos;s interior, the V10 edition features white trim, along with the carbon fiber bits, and of course the 5.2-liter FSI V10 with all of its 525 hp and 391 lb-ft. 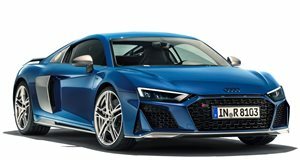 Delivery is slated to begin later this month, with pricing starting at $137,700 for the V8 model with manual transmission, and up to $170,600 for the R8 V10 with the R tronic gearbox.